Create that quiet spot to write and create with the perfect Amish made office furniture to support you. 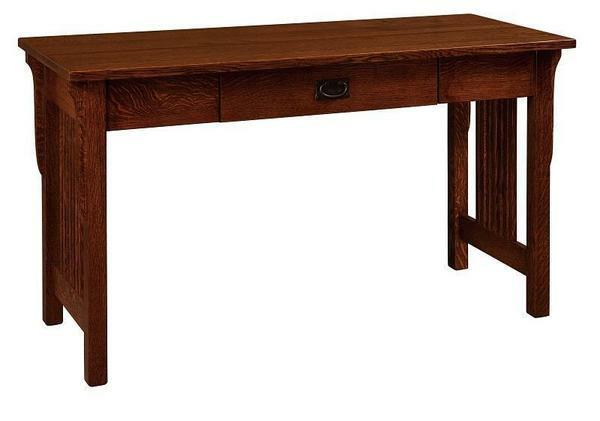 The Amish Lancaster Mission Writing Desk invites creativity and provides just the right work space for writing. Handcrafted in the lovely mission style, the Lancaster is simple and strong, with lovely mission slatwork on the sides and sculpted corbels are added for extra flair. A solid wood writing desk provides work space and room for your laptop and writing tools, but little else. This mission furniture can create a nice desk space in your home office or can serve as a beautiful hallway or foyer table.